The Bourne Identity: As The Bourne Identity begins, Jason Bourne (Matt Damon) tries to discover the truth of his past with no memory at all. His only clues are a gun, thousands of dollars in various currencies and valid passports from numerous countries - each listing a different identity. Within minutes, Bourne is on the run from a seemingly ever-present agency, relying on language and fighting skills he didn't even know he possessed t..
All five Bourne films are available together in The Bourne Ultimate Collection! Matt Damon is Jason Bourne, an elite government agent determined to outwit and outmanoeuvre anyone who stands in the way of his mission to discover the secrets of his mysterious past. As part of the next generation of genetically-engineered agents, Jeremy Renner as Aaron Cross attempts to finish what Bourne started. Follow their explosive, action-packed adve..
Own Jason Bourne (5 Film) Collection DVD from Deff, DVD, Blu-Ray & 4K Video Specialists - Free UK Delivery..
Matt Damon returns to his most iconic role in Jason Bourne. Paul Greengrass, the director of The Bourne Supremacy and The Bourne Ultimatum, once again joins Damon for the next chapter of Universal Pictures' Bourne franchise, which finds the CIA's most lethal operative drawn out of the shadows. Damon is joined by Alicia Vikander, Vincent Cassel and Tommy Lee Jones, while Julia Stiles reprises her role in the series. Special Features Bri..
Special Features Action-Packed Deleted Scenes, The Bourne Mastermind: Robert Ludlum, From Identity To Supremacy: Jason & Marie, The Bourne Diagnosis, Cloak And Dagger: Covert OPs, Inside A Fight Sequence, On The Move WIth Jason Bourne, Bourne To Be WIld: Fight Training, Blowing Things Up, Man on The Move: Jason Bourne, Enter Aaron Cross, Crossing Continents: Legacy On Location, Filmmaker Commentaries, And Much More!.. Racing to unlock the secret of his own identity, amnesiac operative Jason Bourne discovers the deadly truth: he’s the government’s number one target, a $30 million weapon it no longer trusts. Academy Award winner Matt Damon stars in this super-charged, thrill-a-minute spectacular loaded with non-stop action! Special Features Alternate Opening And Alternate Ending, Deleted Scenes, Feature Commentary With Director Doug Liman, Access Gran.. He was the perfect weapon, until he became the target. Explosive action-thriller starring Academy Award Winner Matt Damon (Good Will Hunting) and Franka Potente (Blow) and based on the international bestseller by Robert Ludlum. 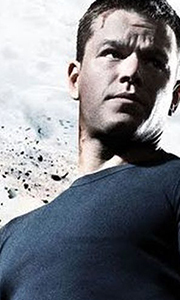 Rescued with two bullets in his back, Jason Bourne (Damon) has completely lost his memory. Soon it becomes very clear that he has to find out his identity to save his life. Hunted by his killers and racing agains.. The narrative architect behind the Bourne flms, Tony Gilroy, returns to expand the Bourne universe once more in the next chapter of the thrilling action series. The Bourne Legacy introduces us to a new hero, Aaron Cross (Jeremy Renner), whose life-or-death stakes have been triggered by the events of the first three flms. For The Bourne Legacy, Renner joins fellow series newcomers Rachel Weisz and Edward Norton, while franchise veterans .. The narrative architect behind the Bourne films, Tony Gilroy, returns to expand the Bourne universe once more in the next chapter of the thrilling action series. The Bourne Legacy introduces us to a new hero, Aaron Cross (Jeremy Renner), whose life-or-death stakes have been triggered by the events of the first three films. For the Bourne Legacy, Renner joins fellow series newcomers Rachel Weisz and Edward Norton, while franchise veteran.. The Bourne Legacy introduces a brand new hero Aaron Cross (Jeremy Renner) - an agent on the run from destruction and on a journey to discover the truth, in life-or-death stakes created by events of the first three Bourne Films. Cross and Dr. Shearing (Rachel Weisz) fight to survive as CIA Ops, led by Eric Byer (Edward Norton) attempt to shut down their Operation and make everyone involved disappear for good. The brains behind the previo.. The fourth outing in the popular espionage action thriller franchise based on the Jason Bourne novels by Robert Ludlum. Written and directed by Tony Gilroy, who scripted the first three films, the film moves away from the central Bourne character (played in the opening trilogy by Matt Damon) to focus on a new protagonist, CIA operative Aaron Cross (Jeremy Renner). The film, which takes up events where 'The Bourne Ultimatum' left off, se..
Academy Award Winner Matt Damon is on the run again as Jason Bourne, the former CIA trained assassin, in this smart and suspenseful action-thriller. Suffering from amnesia, Bourne has left his violent past behind and is living a normal life with girlfriend Marie. But his plans for a peaceful life are crushed when he narrowly escapes an assassination attempt. Now hunted by an unknown enemy, Bourne proves to be neither an easy target nor ..
Academy Award winner Matt Damon is trained assassin Jason Bourne. Having lost his memory and the one person he loved, he is undeterred by the barrage of bullets from a new generation of highly-trained killers, tracking his every move and who will stop at nothing to prevent him from learning his true identity. The Bourne Ultimatum unfolds with heart-stopping action, death-defying stunts and white-knuckle excitement in the film critics ar..
Academy Award winner Matt Damon is trained assassin Jason Bourne. Having lost his memory and the one person he loved, he is undeterred by the barrage of bullets from a new generation of highly-trained killers, tracking his every move and who will stop at nothing to prevent him from learning his true identity. The Bourne Ultimatum unfolds with heart-stopping action and excitement. Special Features Feature Commentary With Director Paul G..